(Photo by Darren Andrew Weimert) Anne Campbell (left) with Mimi Barash Coppersmith. Born between 1946 and 1964, the baby boomer generation is changing the face of senior living and retirement communities. As the number of Americans over the age of 55 begins to grow, senior facilities like Juniper Village at Brookline are integrating technology and innovative programs to keep up with residents’ desire to stay active and have access to learning opportunities, activities, and events – all designed to enhance the retirement experience. Juniper Village’s State College property consists of five buildings comprised of independent living apartments, two personal care communities, and a skilled nursing/rehabilitation and long-term care facility. A short distance from the main campus is a free-standing memory care community. Located at 1930 Cliffside Drive in State College, Juniper Village at Brookline was awarded a 2018 Best of Senior Living award by SeniorAdvisor.com, a designation that fewer than 1 percent of providers get nationwide, and given only to those who receive consistently high ratings and positive reviews from residents, families, and visitors. Anne Campbell took over the role as senior executive director in October 2017. She oversees all campus operations for Juniper Village at Brookline and is responsible for improving the quality of programming, identifying opportunities at multiple levels from budgets and strategic planning to goal-setting. Prior to her current role, she served as executive director of Juniper Village for 11 years. Originally from the Lehigh Valley area, Campbell graduated in 1996 from Bloomsburg University with a degree in social work. Moving to State College after her husband, Jim, got a job at Penn State, the couple has two teenagers attending State High. 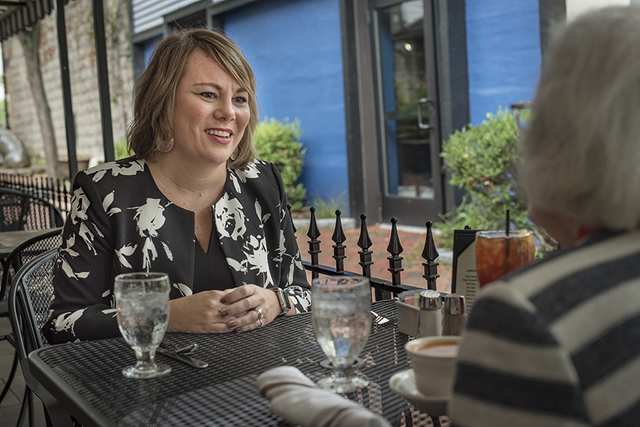 Town&Gown founder Mimi Barash Coppersmith sat down with Campbell at The Tavern Restaurant to discuss the growth of senior care in our community, the kinds of programming retirees are looking for nowadays, and some of the challenges she faces to facilitate all of the needs of her residents. Mimi: Well, how about that, after all these years I'm finally getting to sit down with you. You came here how many years ago? Anne: I've been in State College for the last 15 years. I started with Brookline about 13 years ago. Mimi: What did you do before that? Anne: When we first moved here, I stayed home with my children for a couple of years and when it was time to enter the workforce again, I saw an ad for the job at Brookline. Mimi: And you have the good fortune of being a leader of a sizable operation that was one of the early places that addressed the answer to care for the aged. Anne: I would say so. We have roughly 250 residents between all the places. Mimi: Since I'm a member of that category and I have a dear friend who has 24/7 caregivers, I have a personal experience of the details and pressure of such a business. How do you make it all run smoothly? Anne: I'm very fortunate to have a tremendous group of leaders who work so well together as a team. We're very fortunate too, in the programs that we have to move things forward. It's an ever-changing industry. Mimi: It’s really changing because the demand just keeps going up. Healthcare has advanced to the point where more of us have an opportunity to live longer, but not necessarily the way we'd like to live. Share our options. The programming is probably as important as the care. Anne: Options are the key. The wants and the needs of the folks that are living in our community have changed. They want choice. The programming is one of the things that I'm most proud of that we do at Juniper. We have just incredible partnerships with outside groups like the Pennsylvania Center for the Book, for instance. One of my colleagues came up with this wonderful idea to have our residents meet with poets and create poetry. These poets come and they write poetry based on our residents’ lives. They meet our residents, spend some time, and interview them. They facilitate book clubs. We have these incredibly rich stories for the folks that live with us and being able to tell those stories is just amazing. Mimi: Oh, wow. And when they write their stories, do they share them with the other residents? Anne: Yes, we have events surrounding them and we open it to families and to the community. In addition, we have an outside artist that comes in and teaches watercolor. One of the most exciting art programs that we have is in our memory care building. They have a really robust art therapy program and they do an art auction every year that raises money for the Alzheimer's Association. The art that they produce is beautiful. Our connections director teaches it because it's happening all the time. It's just a regular integral part of the program that they have there. We have had different visiting teachers in, but we're fortunate to have a connections director that has a good art background. Mimi: Do you ever exhibit the art? Anne: We do it every February. We have exhibits and an auction. The art that they have is on the walls, but we do have certain events around it and our residents sell their art. We have a theater group that recently staged a production. I think our average age of our production was 89, and up to 97. We had the fortune of having Rich Biever from FUSE Productions collaborate with us on that. I'm excited about these collaborations. Mimi: On a typical day, what's your biggest problem? Anne: I would say our biggest issue on a typical day is workforce. That is not unusual for our industry, for healthcare in general. I think we all know that there's a nursing shortage and so I would say the things that keep me up at night are the workforce issues. It’s challenging to try to find those qualified people that will stay, but also stay for the right reasons and really believe in our mission and want to work for that goal. Our mission at Juniper is we believe that we nurture with the spirit of life in each individual that we touch. It’s our goal to nurture that spirit not only in our residents, but in all of our stakeholders and especially our staff. Mimi: What are you doing to combat the challenges of personnel? Anne: Some of it involves innovative things like offering programs that you're not going to get at other places. The new thing is we are going to be rolling out what we're calling Redwood Urgent Care for our associates. Folks that come to work for Juniper, full-time associates, will get six free office visits a year. Healthcare, as you know, is very expensive; insurance is very expensive. Not everybody can afford it. Mimi: So, you’re giving them a benefit of free health care? Anne: Free health care in addition to their regular benefits – for small things. It's not for major medical issues, it is for urgent issues. If somebody needs a strep test or something like that, that's something that we can manage. We're hoping that it helps twofold. It provides some financial relief for our associates for what those office visits may cost them. But in addition to that, we're hoping that it helps them be healthier and improves their wellness. There are a lot of benefits that can come out of improving wellness; people feel better, they come to work more often. The other thing that we're doing for workforce is we have an initiative at Juniper called “15 by 20.” We are on the road – and we're almost there – by 2020 to have our minimum starting wage at our communities be $15 an hour. Mimi: Good for you. What is it now? Anne: Right now we're at $13.50. So, by the end of 2020 we’ll be at $15 an hour for a minimum starting wage for any position in our community, and obviously it goes from there up based on licensing and things like that. Mimi: You have quite a rehab program, compared to a lot of places. Tell me a little bit more about it. Anne: We are a skilled nursing and rehabilitation center. We have long-term care nursing for folks that live there, but we also have skilled nursing for people that are there for rehabilitation. So, if someone needs to have a short-term stay there, for instance if they had a surgery and need a little bit of rehab, need some therapy services, they'll come to us for a short-term stay. Usually the average length of stay for those folks is only about two weeks. So, we have a lot of people coming and going out of our skilled nursing and rehabilitation center. In June, we celebrated 100 discharges to home. So, that's a whole lot of people coming in and out of our building and receiving those rehab services. Mimi: What else do you do that excites you? Anne: We do a lot with technology. We are a very data-driven company. We have a program called Refresh and this was a result of a research program from Penn State that we adapted. The unique and cool thing about it is that it puts residents and associates together to do mindfulness programs during the workday. So, you get our associates sitting side-by-side with residents. It involves meditation, stretching, and setting intentions for the day. Having our residents and associates sit together to do it is pretty cool. Sometimes it helps with anxiety and stress, but it energizes us too. Mimi: How do you meet the challenge of food that everybody likes? Anne: That's a good one. I’ve been very fortunate to have an amazing executive chef. He does a wonderful job and I'll tell you how we meet the challenges. We listen to our residents and we give them what they ask for. It's hard to cook for that many people and have everybody agree on the same thing, but he has taken us leaps and bounds with that and the key to his success is listening and really providing what is being asked of him. Anne: It’s my favorite bumper sticker. They are a hot commodity at our community. We do believe very strongly that life does not end when somebody turns a certain age. We know that we all have so much to give back and we have so much to contribute up until our last day. Mimi: People in this business, it seems to me, are a subset of loving people on both sides of the equation. Do you ever get together with the other people in the same business to collaborate and think about things you can all do working together? Anne: Absolutely. I served as the president of the Geriatric Interest Network for a couple of years. It's an industry networking group here in State College for Centre County. We get together three times a month. We have a lunch, breakfast, and an after-hours. Mimi: That’s wonderful. Really, you’re not competing with one another. Anne: We all have something to offer and we're here to help, support, and learn from one another. Mimi: What have I not asked you that I should? Anne: I should have probably talked a little bit about Connect4Life, an integrated care model that Juniper is becoming pretty well known for nationwide, and we're doing it here in State College. It's taking a high-tech approach and a high-touch approach together in order to generate better outcomes. Our high-tech is having all of our collaborative partners use our electronic health record, because sometimes in the healthcare industry the struggles that we have are that we all have different platforms to get information. When we can use one platform, we’re able to all read from the same playbook for our residents’ care. But in addition to that, we have what we call a medical concierge and it's really concierge health services for a resident. Taking those two pieces together has generated really good outcomes for us to reduce re-hospitalizations and increase satisfaction as well for a resident. Mimi: Do you ever survey your residents to see what they think of your service? Anne: We do. We do it annually and then sometimes some spot pulse surveys as well. Mimi: I would imagine that's a great help to you. Anne: It is. We do make changes based on those survey results. We are constantly changing and trying to improve not only for those outcomes, but one of the outcomes is customer and associate satisfaction as well. We were just certified by an institute as a great place to work, so that's pretty exciting. Mimi: I want to thank you very much for improving my knowledge of the challenges that you face every day, and I wish you only good stuff. Anne: Thank you so much. I appreciate being invited. Anne Campbell (left), senior executive director of Juniper Village at Brookline, talks with Town&Gown founder Mimi Barash Coppersmith at The Tavern.